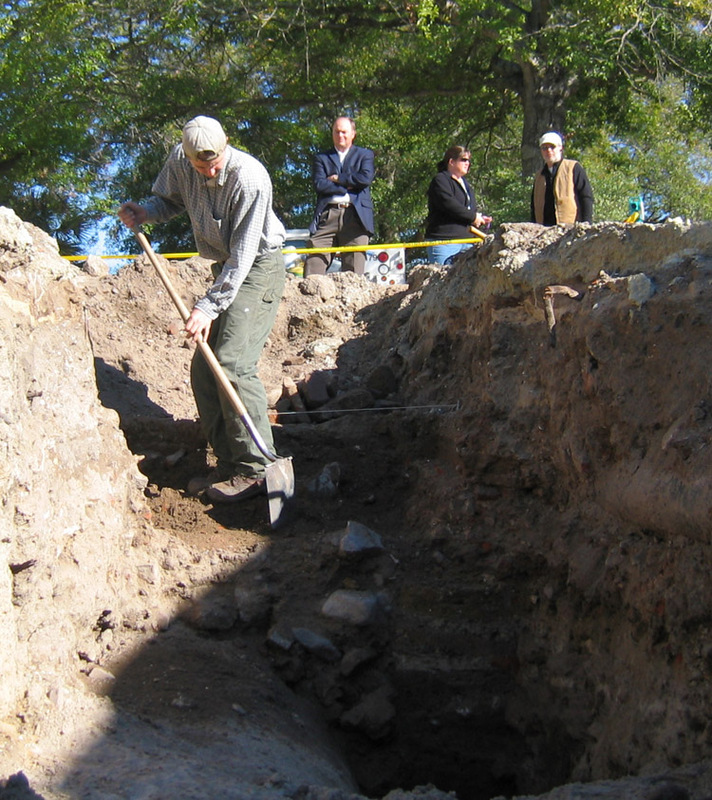 First, Martha Zierden initiated a new controlled unit near the southeast corner of the dig site (actually an eastward extension of Trench 2), which Brian Falls of Brockington and Associates continued to work for the rest of the afternoon. 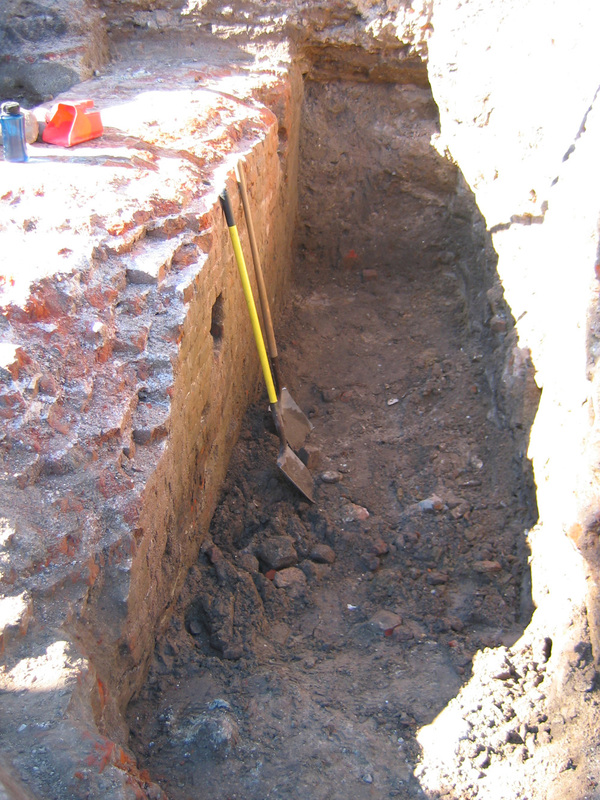 The primary purpose of this unit, which is far removed from the redan brickwork, is to establish as complete a record of the soil strata as possible in order to help date the features elsewhere in the site. Second, Jimmy Lefebre continued to trowel the controlled unit in Trench 1 in which Blair Stec uncovered a row of wooden pilings last Friday. As seen in the photo here, they’ve carefully uncovered a row—perhaps a double row—of pilings in situ, which runs in a line parallel to the face of the redan. We know from the colonial legislative journals that the redan (and the entire length of the brick curtain line along East Bay Street) was protected from the surf and storms by a double row of piles. We don’t know, however, if the piles were supposed to be right next to the wall or placed at a distance. 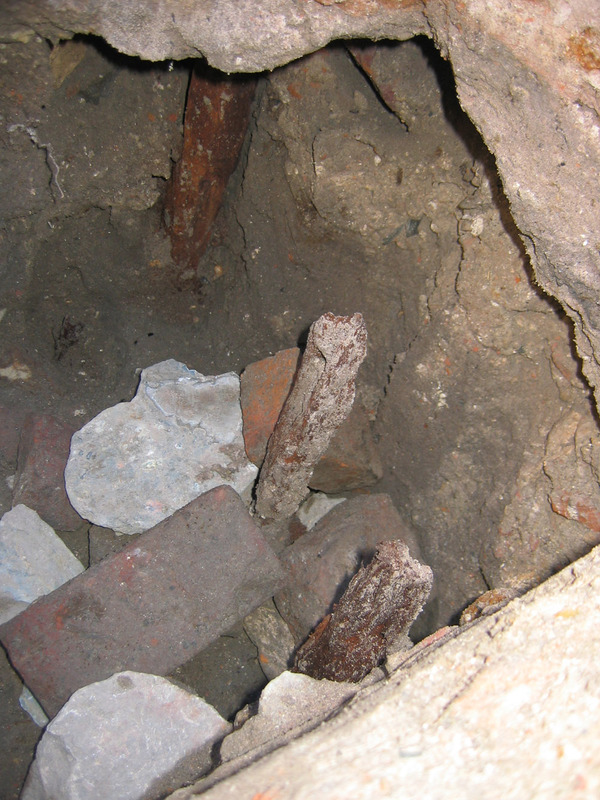 From these newly-uncovered artifacts, we’re inclined to believe that the row of piles might have been as much as sixteen feet away from the wall. The moat that existed on the outside of the redan between 1745 and 1764, therefore, may have been on the outside of this row of pilings. 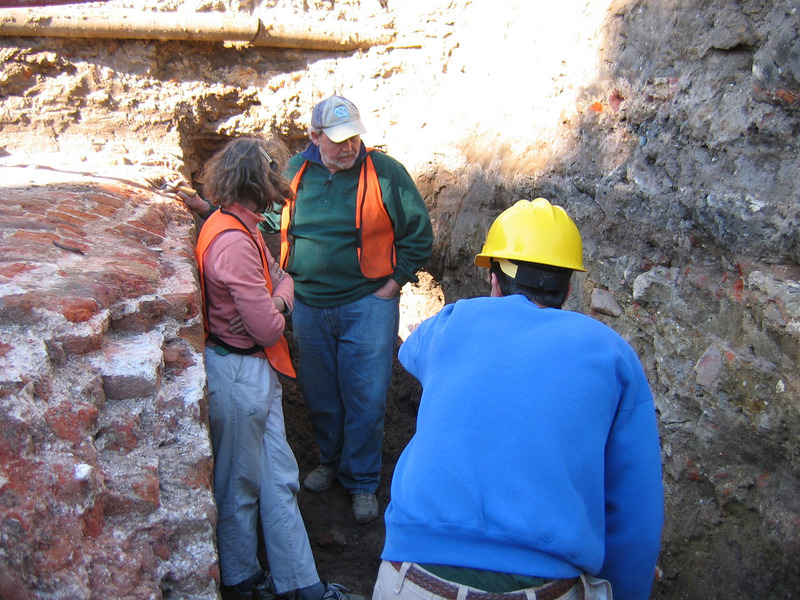 Third, we’re working hard to carefully remove the earth around the base of the exposed brick redan wall. Andrew Agha continues to trowel through the soil behind the wall (on the street side), and is on the verge of a very old and exciting layer. Meanwhile, we started clearing more soil away from the front or river side of the redan. In the process of doing that, Ron Anthony noticed that the deep soil layer contains a rich amount of pottery sherds, so that area will be more carefully mapped and the soil screened by volunteers. These areas around the footing of the exposed redan will undoubtedly receive the bulk of our attention for the remainder of the dig. Finally, a large number of volunteers screened artifacts today, and they continue to find scores of pottery sherds and butchered bone fragments. 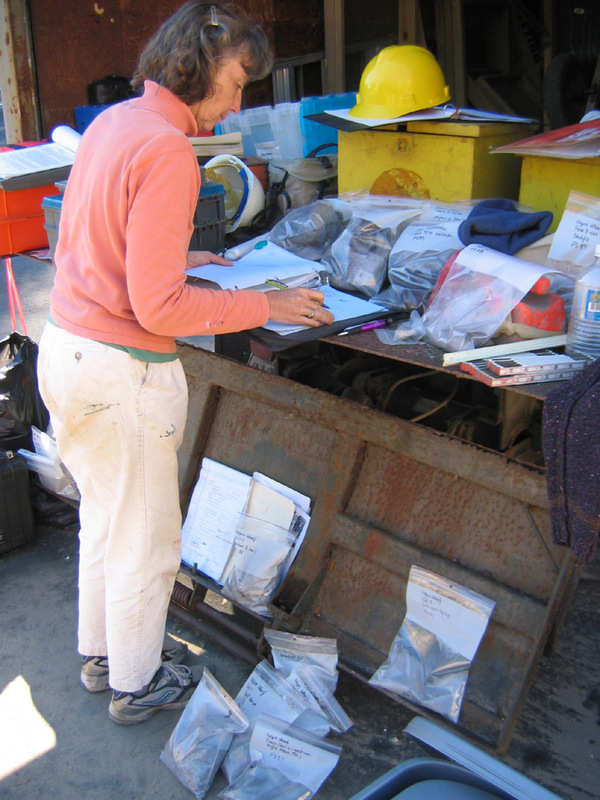 So many artifacts have been found, in fact, that Martha Zierden had to purchase additional storage containers to transport the bagged materials back to the Charleston Museum! Way to go, folks—now we just need funds for Martha and her staff to perform the necessary lab work to identify and curate the artifacts. 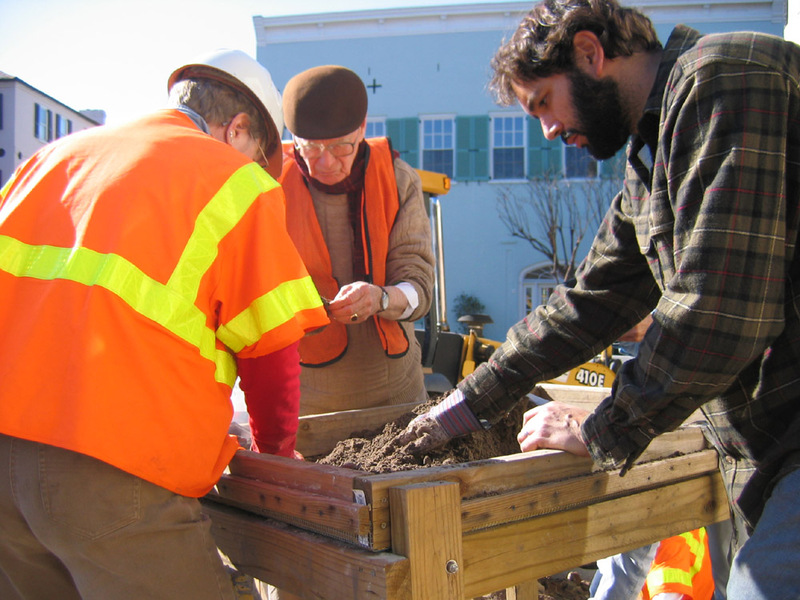 Your tax-deductible contributions for this project can directed to the Historic Charleston Foundation, with the specification that the funds are to be applied to the Walled City Task Force. For more information, please contact Katherine Saunders at (843) 723-3646, or email her at ksaunders[at]historiccharleston.org.